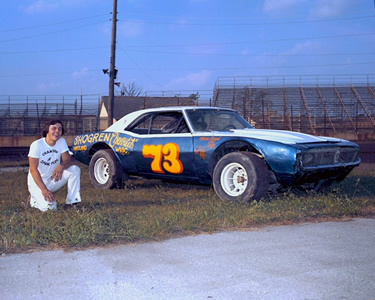 CONCORD, N.C. (Sept. 25, 2018) – Russ Lake first photographed Alan Kulwicki racing at the old Hales Corners Speedway during Kulwicki’s 1973 rookie season on the Milwaukee area third-mile dirt oval. Some 45 years later, it is one of legendary lensman Lake’s prized images that has been selected to serve as Kulwicki’s primary photo for his induction into the NASCAR Hall of Fame. Photo A: Alan Kulwicki in deep thought. Taken by Russ Lake during 1993 Speed Weeks at Daytona International Speedway and selected for official use in Kulwicki’s 2019 induction into the NASCAR Hall of Fame. 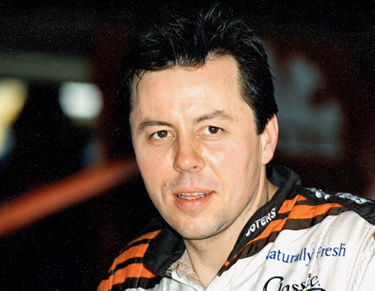 Photos B & C: Alan Kulwicki in his racing roots. 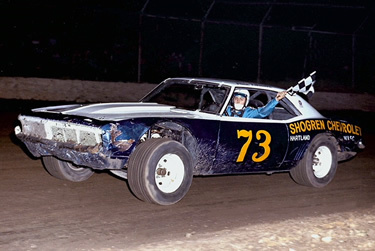 Taken by Russ Lake at Hales Corners Speedway in 1973. Photo D: Alan and Gerry Kulwicki, father & son. Taken by Russ Lake in 1980 at the Milwaukee Mile. 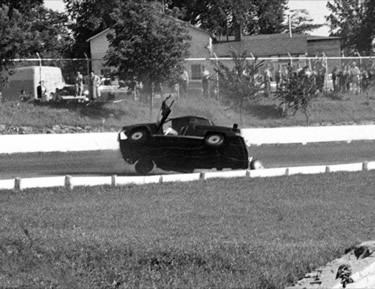 Photo E: Myron Fohr rolling over his Studebaker race car. Taken by then 15-year-old Russ Lake on Aug. 23, 1951 at the Milwaukee Mile. First published photo by Lake, as it appeared in the Aug. 24, 1951 edition of the Milwaukee Sentinel. Photo F: Legendary racing photographer Russ Lake. Lake could be categorized as a “second generation racer” as his father, Ted, was a noted promoter and official. The elder Lake began his career in race promotion at the Milwaukee Mile in 1929. He served as a Deputy Chief Observer with USAC. Ted Lake was a fixture at Indianapolis Motor Speedway, working in numerous capacities from 1936 through 1996. Russ Lake credits his father for getting him interested in racing photography. “As a young fellow, I had the opportunity to travel with my dad to race tracks all over the country,” said Lake, who resides in North Prairie, in Waukesha County, Wisconsin. “I went to my first Indianapolis 500 in 1952. Through my dad, I was introduced to Armin Krueger, who was the most famous racing photographer back in those days. I learned a lot from Armin. “My racing photography was never a fulltime occupation,” said Lake, who carried the title of “official photographer” for the Milwaukee Mile for years. “I was able to get into the restaurant business (owned and operated George Webb locations in Oconomowoc and Watertown for many years) and that subsidized my racing habit through all the years. That’s one of the reasons I enjoyed following Alan through his career. He was from our area and followed his dream and passion all the way to the top. 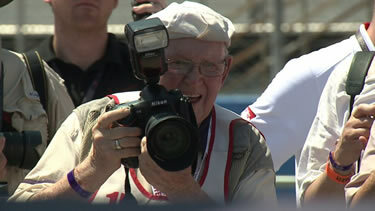 While Lake may best be known for his photographic contributions through the years, he certainly deserves accolades for giving back to his community. He founded the Wisconsin Motorsports Charities, Inc., in 1991. For 16 years, Lake and racer/broadcaster David Hobbs organized and hosted the Wisconsin Charities Recognition Dinner which featured icons from all walks of motorsports. The annual dinner raised more than $450,000 for the Ranch Community Services. For more than a decade, Lake’s late special needs son, Douglas, was a client of the Menomonee Falls-based organization that works with individuals with disabilities. Lake is scheduled to be a special guest of the KDDP during the NASCAR Hall of Fame induction activities this winter in Charlotte.